This collection of essays is the result of a major conference focusing specifically on the role of Scotland’s print culture in shaping the literature and politics of the long eighteenth century. 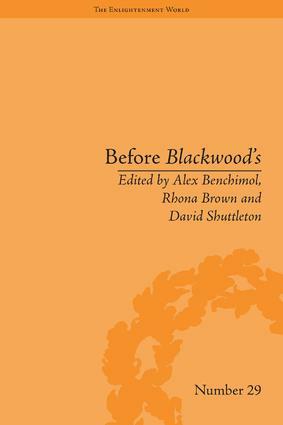 In contrast to previous studies, this work treats Blackwood’s Magazine as the culmination of a long tradition rather than a starting point. "…an illuminating, provocative, integral part of any Scottish literature or history course based on the Enlightenment and Romantic periods." This series features monographs that take an innovative and challenging look at the political and intellectual history of the Enlightenment period. The richness of the Enlightenment experience makes it a significant topic for study. It had a profound impact on nearly every aspect of life during the long eighteenth century and many of its values are familiar to modern society. Some of the key themes that this series embraces include the scientific revolution; philosophical origins and progress of the Enlightenment; high and popular culture; the political impact of the Enlightenment; and its comparative impact in a broad European context.